Loose Village is well known for its pretty stream with its unusual central causeway, the church and tumble of old cottages all set in an attractive valley. Although it has suffered from a certain amount of modern development, it has, since the beginning of the century at least, covered itself ever more deeply in a blanket of trees and greenery, as though trying to hold on to its individuality and ancient past. 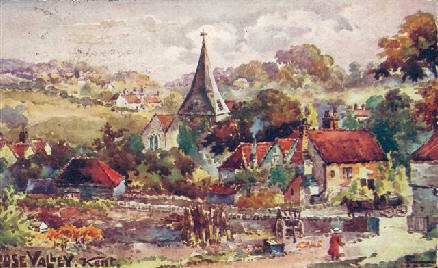 It lies at the heart of a conservation area based around the Loose Stream.The name of Loose (pronounced looz) is, according to the experts, Old English for pig-sty, which is presumably a reference not to the state of the village in Saxon times but to the chief concern of its peasant population. By the Norman conquest the status of the village had evidently risen little, for in the Domesday Survey, Loose was lumped in with East Farleigh. Its survival, however, was guaranteed by one thing, the Loose stream, whose clear fast-flowing waters ran a whole chain of mills down as far as Tovil. By the nineteenth century several of these were producing fine-quality paper, helping to make the Maidstone area famous for its paper industry. One of the old mills – Hayle Mill – still partly remains.Today there must be few Loose residents who are connected with paper-making, or for that matter with any of the other activities of which the village could once boast: tanning, fulling, quarrying, hop-farming, brewing, and corn-grinding. Virtually all that is left to us is fruit and sheep farming. But this makes it all the more intriguing, as we can play the detective and seek out from amongst the stones and timbers, and the folk memories, evidence for the history of a pretty village. The remains of thirteen mills and their associated water management lie along the Loose Valley, the one mainly complete being Hayle Mill which has in recent years been converted into a gated residential complex.